In six years, this company returned over 1,000%. It's expensive now, but its ambitions are growing. Those were audacious goals. We now know that, in 2013, Musk was almost forced to sell his company to Alphabet. But that didn't happen -- Tesla met its delivery goals, albeit barely, and was able to stay afloat. 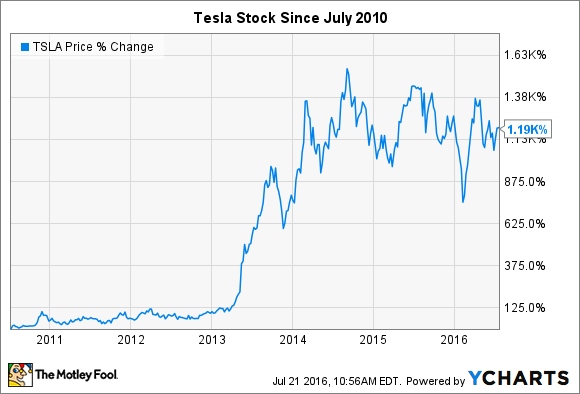 As a result, Tesla has been nothing short of a "millionaire-maker" stock since just after going public. 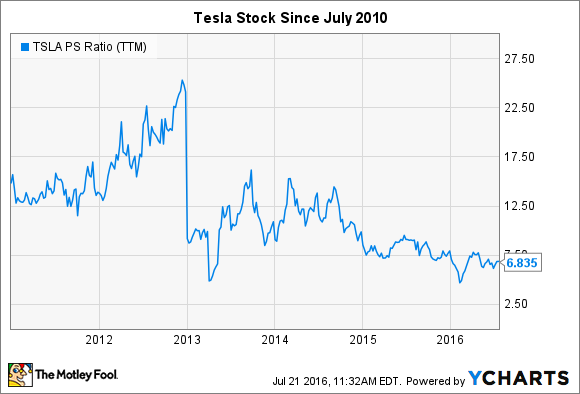 So is it too late to buy into Tesla's stock? P/E and forward P/E represent non-GAAP figures and estimates. Data source: Yahoo! Finance, E*Trade. You can see why putting a price on the company is an almost impossible task. Tesla is expected to start turning a profit in the next year, which will still be very low. As the company has yet to create any positive cash flow from operations, it's also impossible to value it on a free-cash-flow basis. We could try to look at its price-to-sales ratio of 7.8 and compare it to other automakers. Ford currently sells for 0.4 times sales, and GM for 0.3. Even the highest-priced of the major automakers, Toyota, sells for only 0.6 times earnings. It appears that it's definitely too late to get in on the stock. Perhaps if we look at the company's current P/S relative to past levels we might get a more optimistic view. TSLA PS Ratio (TTM) data by YCharts. Still, it is undeniable that the price tag is expensive. What does Musk have to say about this? Recently, 10 years after his original master plan, Musk issued an updated version. As he has accomplished -- or soon will have -- all of the sections of his first memo, it's worth taking a look at what the visionary executive's priorities are now. The entire plan is worth a read, but like last time, he provides a handy list to sum up his thoughts. Musk wants to expand into smaller SUVs and pickups, as well as semi trucks and city buses. By addressing those four additional segments, he believes that Tesla will become accessible to most consumers. If you're wondering how that could be enough (where's a four-door sedan equivalent, you might ask), focus on Musk's point about self-driving capabilities. A Tesla owner could allow his or her car to be used by others (somewhat akin to Uber's model, but with no driver) during the day, thus earning money while not using it. Musk also has a vision for changing how energy is generated by and for average Americans. If the SolarCity (NASDAQ:SCTY.DL) merger goes through, he sees "the individual as their own utility." Those are huge goals. And if they get accomplished, Tesla's market cap of $33 billion today might seem like a pittance in 2026. But it's important to remember that, at one point in 2013, Musk was two weeks away from running out of money entirely. The next phase of his odyssey likely involves a similar level of risk. If the SolarCity merger proceeds, I will become a de facto Tesla shareholder. I'm willing to wait for that to happen, and to consider that to be the first of three purchases of Tesla I'd like to make moving forward. Commonly referred to as "buying in thirds," this approach allows me to gain some exposure to Tesla's millionaire-making capabilities while not betting the farm on a risky endeavor. For investors interested in putting their own skin in the game, I suggest a similar approach to easing into the stock.